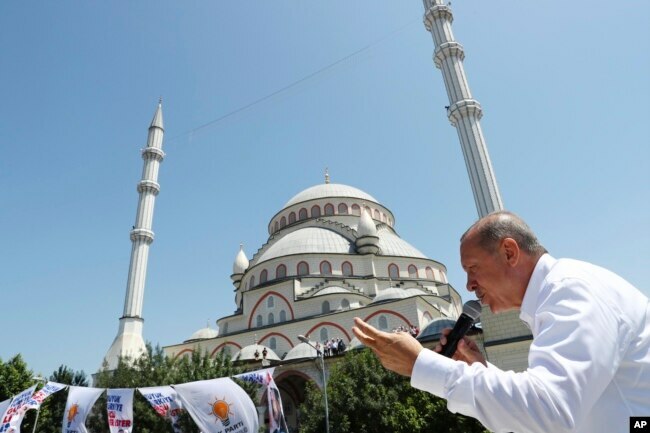 A leaked video of Turkish President Recep Tayyip Erdogan has vote sparked fears of possible vote rigging ahead of presidential and parliamentary elections scheduled for June 24. The HDP is hovering around the 10 percent electoral threshold needed to enter parliament. Failure to pass the threshold would result in HDP votes being transferred to the party’s chief rival in Turkey’s predominantly Kurdish southeast, the ruling AKP. That would give the AKP around 60 parliamentary seats, which, analysts say, could prove decisive in the closely fought campaign. The video of the closed-door Istanbul meeting held earlier this month was published on social media by an attending official. The official quickly removed the recording, but not before it went viral. “AKP chairman Erdogan openly incites people to commit a crime. He plans to steal our votes by cheating and pressure to bring us below the election threshold,” tweeted the HDP. 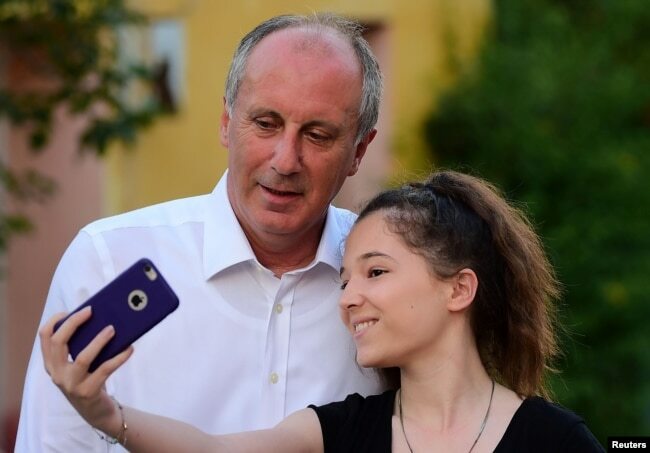 Muharrem Ince, presidential candidate of Turkey’s main opposition Republican People’s Party (CHP), poses for a selfie with a supporter of him in Elmalik village in Yalova province, Turkey, June 14, 2018. Ince also pledged to ensure the security of voting. “We will protect the ballot boxes. … I don’t want my nation or people to feel any doubt about this,” he added. Last year’s ballot proposal to extend presidential powers won narrow approval amid allegations of fraud. International monitors from the Organization for Security and Cooperation in Europe strongly criticized the vote, highlighting the use of ballots without an official stamp. Stamping is seen as an essential measure to prevent tampering. Shortly before calling the June elections, the government pushed through electoral changes, including allowing the use of unstamped votes, relocating some polling stations and allowing security personnel at those venues. The government said the measures ensured the security of the vote, in particular in southeast Turkey, which has been a center of fighting against Kurdish insurgents. U.S.-based Human Rights Watch strongly criticized the move. “There are concerns that the decision is designed to — and will — prevent effective monitoring of fairness at the polls and that the presence of police and gendarmes could intimidate voters from voting for their chosen party if it is not part of the AKP alliance,” the rights group said. Recep Tayyip Erdogan, Turkey’s president and ruling Justice and Development Party leader, addresses his supporters during an election rally in Istanbul, June 15, 2018. More than 140,000 voters will have to travel as far as 30 kilometers to reach polling stations that were moved in the predominantly Kurdish southeast. Critics say the areas affected are strongholds of the HDP and that the move is aimed at voter suppression, which authorities deny. The monitoring of voter stations, particularly in the predominantly Kurdish region, is seen as key by the opposition to ensuring a fair vote. Sinan Ulgen of the Istanbul-based Edam research institution said voter security concerns are bringing together a traditionally factious opposition. “The opposition now is better organized, compared to the past, even to [last year’s] referendum, especially the emergence of the Iyi and Saddet parties, which are part of the opposition. Because in the past, election monitoring by the opposition rested on the shoulders of the CHP in most of the country and the pro-Kurdish HDP in the southeast of the country,” Ulgen said. Opposition cooperation over voter security has led to ideological barriers being broken down. The Iyi, a hardline Turkish nationalist party, and the pro-Kurdish HDP are now collaborating as part of a broader alliance to ensure a fair vote. “They are in talks to coordinate their approach to prevent any election fraud. Whether it is sufficient, we shall see,” Ulgen said.